Where did I backup that file again? If you have asked yourself this or a similar question you might need a Disk Catalog Software which keeps a record of the contents on all the media that has been processed by it. The basics of the disk catalog software Visual CD are easy to explain. Just pop a disk in and click on the New menu entry in the top menu. 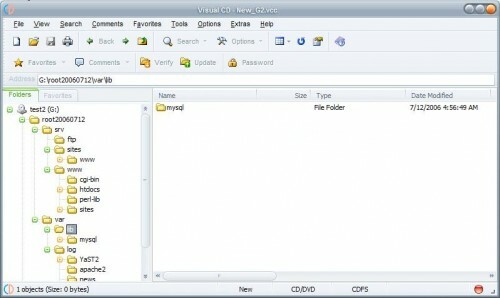 Visual CD will start the disk scanning and file indexing process. I kid you not if I say that this can take a while depending on the amount and type of files on the disk. Most files get simply indexed but some get indexed with additional information. The contents of archives gets indexed as well or the tags of music files. A disk catalog is created in the end and stored locally. Each disk catalog can be searched independently from each other or to search across multiple disk catalogs. The additional information, like mp3 tags, are included by default. Not everything is indexed by default and stored in each disk catalog. The options contain numerous settings that index additional information. Go there to add video, picture, mp3, music and hidden files & folders to the indexing process.Visual CD can also create thumbnails of images and videos that are then displayed during searches or while browsing a disk catalog. It's pretty obvious that each additional setting can have a huge influence on the indexing process and the time it takes to create the disk catalog. One interesting aspect is the use of comments that can be added. Comments can also be included in searches. The disk catalog software comes with a few extras like a renamer and duplicate finder which add to the value of the software program. Rarst check out Cathy, the speed is incredible! It is free, but not so powerfull as shareware competitors. I use Camel Disc Catalog. It has much more powerful search and can import description from internet. I have more than 1000 DVD’s with video, music and games, so even if I find better orginizer I will not move on it. But CDC is best! http://www.lyrasoftware.com/disclib is my favorite for about 9 years now. 1- I use it to put all my cd’s/dvd’s in one library or I can split them up. 2- It can catalogue inside zip files maybe rar also. 3- It’s fairly fast if you organise your cd’s before you burn them mp3,videos,software on each separate disc. I catagorise my discs by type and Db is also by type.